If we want to test an area we could take some honeybees and put some hives there and then check the level of particles that stick to them. It could give us a good indication of how air quality is changing over time. Researchers realized that the build-up of industrial pollution on bees can be used to monitor air quality. 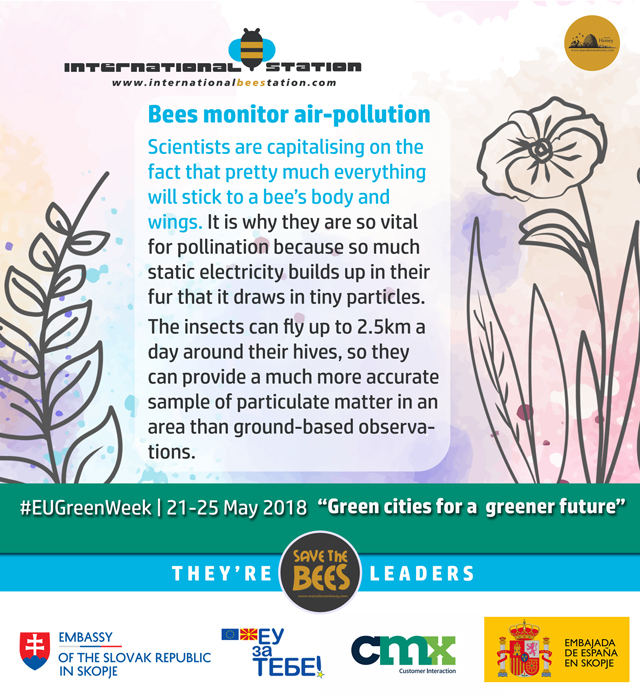 The insects can fly up to 2.5km a day around their hives, so they can provide a much more accurate sample of particulate matter in an area than ground-based observations. The researchers studied bees in an industrial area of Sardinia where dozens of lead-zinc mines operated until recent times, leaving thousands of tonnes of finely ground ore materials exposed. Industrial and mining activity releases a range of fine particles that can remain suspended in the atmosphere; some of these can be particularly harmful to humans. The Sardinian samples showed that The bees’ head, wings and legs were coated with particulate matter of industrial and mining origins, accumulated during their adult life span of about six weeks. The researchers were able to track the origin of these particles, including emission sources several kilometres from the beehives. Their findings suggest that the exposure of humans living in the area to post-mining and industrial pollutants could be far higher than previously thought.